Marianne’s formal training is in geology, but as a daughter of a high school art teacher, she has explored many aspects of art and design since childhood. She began to explore the fiber arts in 1985 when she began handweaving. Introduced to needlefelting in 1998, Marianne has been exploring the design possibilities ever since. Three-dimensional sculptures are her main focus in needlefelting, especially animals, dragons, and human figures. Marianne has been creating nuno felt since being introduced to the technique in 1996. She makes nuno scarves, wraps, vests, and other women’s clothing and accessories. 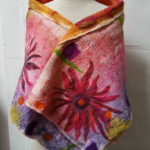 She has been teaching felting techniques since 2000, and sells her felt clothing and sculpture under the Arcady Designs and duBois deRoche labels. She lives in Midcoast Maine.